A baby wipes warmer is essential if you want a safe and comfortable environment for your infant baby when changing diapers and cleaning the baby. We gathered the ten best-rated baby wipe warmers from Munchkin, Hiccapop, Prince Lionheart, OXO, and other brands to find the absolute best baby wipe warmer on the market. 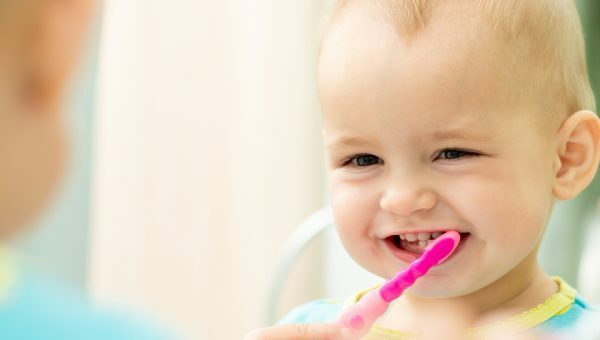 We analyzed their safety, how effective they are in evenly warming wipes, keeping them warm and moist throughout the day, and keeping bacteria at bay. Munchkin makes a line of great baby products including their baby wipe warmer. 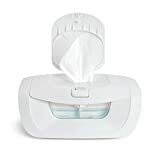 Although it has a low average rating from verified customers, this baby wipe warmer is a great choice for places where you won’t use it too often like the grandparents’ house, a vacation home, or the like. The wipes are kept wet with the mist system built into the warmer itself. 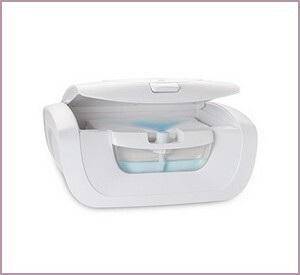 The machine sprays a mist each time you close the lid or press the button on the outside of the box for extra moist wipes. It needs to be plugged into an outlet and its reservoir of water filled up at all times for this machine to work. Most shoppers who bought this product turn it off in the morning and re-plug it in in time for the evening. Some mention the lid won’t properly close after a while of heavy use. 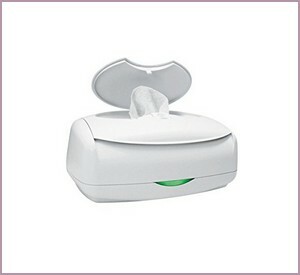 Bottom line: This baby wipe warmer is ideal for parents who don’t need a portable one as it must be plugged into work. 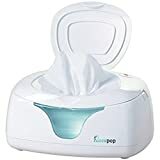 If you find wipe warmers useful, you may also be interested in learning about the best diaper pails on the market today which you can also use to dispose of baby wipes. 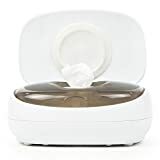 When you need a baby shower gift or are tired of frigid wipes, this baby wipes warmer by Prince Lionheart Ultimate is the one to get. This useful warmer has an EPA-approved additive that prevents micro-organisms from growing, thus ensuring you there will never be mildew, bacteria, viruses, or odors with this baby wipe warmer. 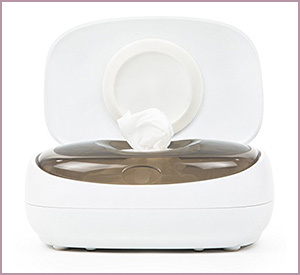 In addition, this is one of the few baby wipe warmers currently on the market that use the Ever-Fresh System – only the Prince Lionheart brand carries this technology. Bottom line: Ideal for parents who need an easily accessible wipe warmer they can use one-handed while changing the baby. When all you need is a basic warmer without all the bells and whistles, this one is the one to get. It keeps the wipe sheets warm without extra moisture or a water reservoir you need to keep refilling. In other words, it is about as basic as it gets. Minimalists will prefer this low-maintenance warmer because all you need is a plug. You won’t need the hefty maintenance of having to keep adding in water for a mister. Cloth wipes are also okay to use with this product which warms your wipes effectively, quickly, and safely. Bottom line: If you want a wipe warmer with a reliable moisture retention system and you’re not too worried about ruining your changing table, this is one of the best baby wipe warmers you could get. 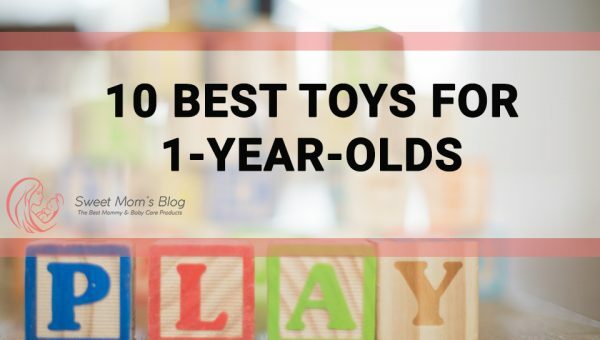 More and more moms have included this product in their registries for a few good reasons. Not only is there an indicator window that lets you see how many more wipes there are, but there is also a night light to make the midnight diaper change routine a breeze. There are two settings for heat that will keep your baby comfortable at all times. The night light shuts off on its own after a few minutes. With its low voltage, you can feel safe with this plugged in the entire day. Bottom line: It’s the best baby wipe warmer for you if you are looking for a stylish, minimalist one that won’t be an eyesore. Note: This product is not available at the moment, but we’ll update this page as soon as it’s back in stock. Until then, you may be interested in trying another similar top-rated product such as the Dexbaby Wipe Warmer with Warm Glow Changing Light. Busy moms that love to be prepared and organized on a daily basis will love this best baby wipe warmer by Tomyth. This can be used for the car or your home as there is a car adapter for your convenience and mobility. Unlike just a regular wipe warmer, this product can even warm milk or a cup of coffee on the bottle holder. It is safe to use and FDA-approved. The non-skid bottom helps you change your baby’s diapers with ease. Perfect for taking along on a road trip or even just a trip to the grocery store. It is definitely among the best baby wipe warmer combos to choose from. 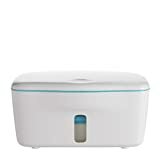 Bottom line: Parents with little space in the nursing room who need a portable device that can warm baby wipes AND milk bottles consider this the best baby wipe warmer combo out there. The Munchkin baby wipes warmer is a low-voltage and a highly efficient device that also comes with a discreet night light with a 10-minute auto shutoff function. 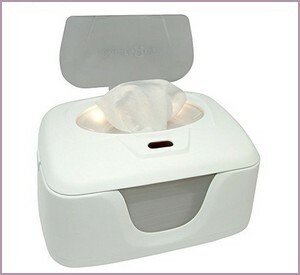 It can hold 100 standard baby wipes and has an easy-access flip-top lid that enables you to use it with just one hand. 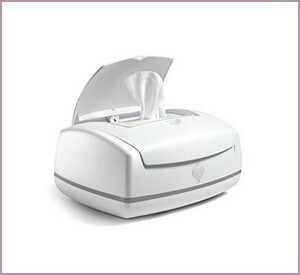 The product also features a view window for the wipes. 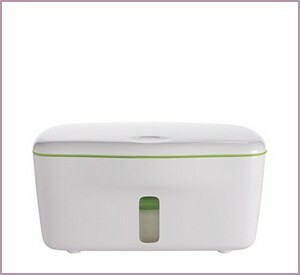 This wipe warmer doesn’t come with a separate water reservoir – you need to pour it into the main container. Bottom line: Due to the long-lasting construction and high-quality materials, this is one of the best baby wipe warmers at the moment. The fourth best baby wipe warmer on this list comes from Prince Lionheart, just like 3 others on this list. The manufacturer states this device gives the warmest wipes, from the top one to the bottom ones. Just like the aforementioned model from Prince Lionheart, this model uses an EPA-approved additive that keeps wipes completely free of bacteria, viruses, and mold. Bottom line: This is one of the best baby wipe warmers on the market thanks to its durability (around 16 months according to customer reviews) and its tightly-sealed lid. 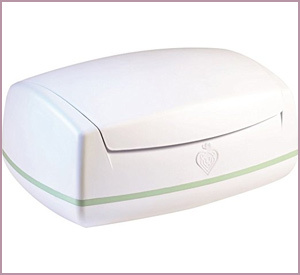 The third best baby wipe warmer from Prince Lionheart on this list according to customer ratings and reviews. Most parents who used this wipe warmer mention it works great with both reusable cloth wipes and disposable ones. 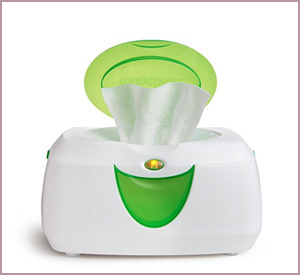 it features a three-part heating system that ensures the wipes are warmed evenly. This device is made of 100% rayon derived from bamboo, comes with a micropore pillow that prevents discoloration, and is completely free of dyes and bleach. Bottom line: This is the third best baby wipe warmer overall and is the perfect choice for cloth wipes. A light push gets the lid to pop up on this baby wipe warmer. The design is slip-proof and has weight to keep it stable as you pull up the sheets. 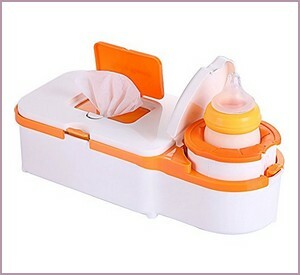 Any brand of wipes can be used with this product and it can fit up to one hundred sheets at a time. A clear indicative window lets you know when you need to put in some more. OXO has ensured that you will never be cold again or pull up dry wipes, as the sheets are kept moist all the time. In addition, it also comes with a silicone gasket that seals moisture in! Bottom line: It’s the second best wipe warmer on this list and definitely worth its price! Recommended Read: Since you’re here, you might also want to check out the best changing pads of the year here! Moms love this product for a few good reasons. Not only does the silicone seal lock in heat and moisture, it keeps the sheets from turning brown. Cold wipes are a shock to the gentle skin of your baby so this one is a relief, as it keeps every sheet nice and warm and works as it should. The built-in night-light lights up when you change your baby in the dark so you don’t have to walk across the room to turn on the lamp yourself. The light turns off by itself as you put your baby back to sleep. Bottom line: This is the absolute best baby wipe warmer currently on the market according to ratings and reviews from verified customers. 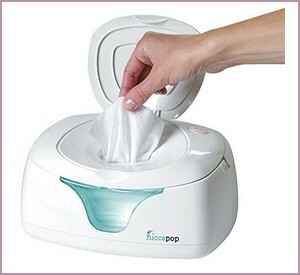 The absolute best baby wipe warmer is made by Hiccapop and is a high-quality, long-lasting, reliable nursery accessory. However, products from OXO, Prince Lionheart, or Munchkin are also good choices – we specifically recommend the Prince Lionheart Warmies Baby Wipe Warmer for cloth wipes. Do you have other suggestions that were not included in this top? What was your experience with baby wipe warmers?